Without Regret: Be More, See More, Achieve More That Really Matters by J. Michael Godfrey, DMin, PhD, PCC is a realistic approach to one of the problems that stand in the way of the pursuit of happiness and a fulfilling life in people — regret. I felt connected with the message from the very start of this book and many readers will definitely feel the same. “You’ve worked hard and have some achievements under your belt, yet you feel a quiet sadness or disappointment over lost opportunities, superficial relationships, missed moments with friends and family, or things you’ve said or done.” We can so easily get stuck in regret that we fail to identify and explore the opportunities that life offers us. But it shouldn’t be so. In this compelling work, the author offers powerful insights, teaching stories, and a step-by-step guide on how to beat regret and reconnect with what we really want. This is one of the best books I have read on personal change and creating a meaningful life. J. Michael Godfrey writes with unusual fluidity, weaving relevant examples into his message and communicating the hope that readers can overcome regret and reach out for the things they have always wanted. The writing is exceptional and the voice irresistible. Without Regret: Be More, See More, Achieve More That Really Matters is the book for you if you want to put the past behind you and start doing work that really matters. This is a powerful tool for those who want to experience inner freedom and resolutely embrace the life they were created to live. Without Regret: Be More, See More, Achieve More That Really Matters by J. Michael Godfrey, DMin, PhD, PCC is an insightful tool for all those readers who are looking for tips and techniques to live a life without regret, and to become the person they are uniquely created to be. It is never too late to break the cycle of regret and the author’s experience is useful when it comes to transforming the future and living a life based on a plan of who they are. The guidance and suggestions to eliminate regret over past choices and lifestyles can be implemented in a way that there are no more regrets. So, is it really possible to live a life without any regrets? Yes, says the author! The topic is relevant and relatable and the author handles it effectively, giving readers tools that are easy to practice and incorporate into their lives, thus enabling them to make a positive transformation in their lives. The message is simple and the author’s guiding hand makes it easy to adjust one's beliefs without any regrets. The manner in which the author helps everyone to discover their true selves is what appeals to me about this book. The clear and concise strategy to move forward in life is uplifting and will help readers lead a fulfilling and enriching life. The author encourages all readers to have a good relationship with God, and not to reject His unmerited grace. This book will help everyone live their lives with integrity rather than despair. I would suggest having this book in one’s personal collection so it can be read as and when there is a need to remove the disorientation in our lives and head toward transformation. 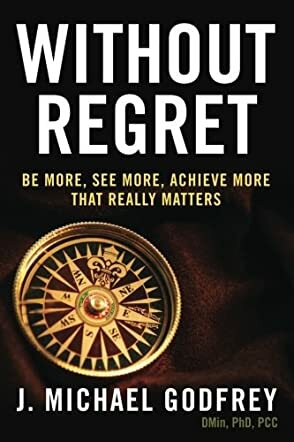 Without Regret: Be More, See More, Achieve More That Really Matters by J. Michael Godfrey is a groundbreaking book that offers readers the tools required to break free from the grip of regret. Each of us has missed opportunities and there are things we wish we had never done. But even though we leave these things behind and move on, they can haunt us and make life miserable as we dwell on them, stuck with the “what ifs,” the “what might have beens,” wasting energy on what we don't have control over anymore. This book is a message of hope to readers, a message that they can set themselves free and pursue their dreams, and create the life they really want. J. Michael Godfrey addresses the root causes of regret, shows its negative impact on the life of the reader, and explains why it is absolutely necessary to overcome regret, and most importantly, he shows readers how to do this. He brings a lot of experience and expertise into the writing, including examples and stories from real life that will speak powerfully to readers. It is rare to find a book with a message that most of us can connect with and this is one of those books, a powerful guide to a life of purpose and freedom. You will not look at yourself the same way after reading this book. Instead you will discover the unique message in what causes regret in your life and reconnect with what makes life worth living. Without Regret is beautifully written, laced with insightful thoughts and a guide that will take readers to where they want to be. Without Regret: Be More, See More, Achieve More That Really Matters is a highly recommended book for effective change! Do you feel like you are going through life on autopilot? Do you wish that you could experience the adventures you only dream of living? Would you like to live a healthy, fulfilled life? Without Regret: Be More, See More, Achieve More That Really Matters by J. Michael Godfrey is a brilliant self-help manual. Starting by defining the various forms of regret, the reader is then shown how to take simple steps to change their lives instantly. Leading the reader through more in-depth actions, such as creating a life mission statement, the author then shows the reader how to develop vision and ways to use it to get more out of life. Further into the book, the reader learns how to make a plan and stick with it without being too inflexible, and how to be assertive in everyday life. With so many more ways to live a regret-free life, this book is certain to inspire any reader to start taking chances, creating a plan, and seeing what wonderful places life takes them! Are you ready to live a life filled with choices and happiness? Without Regret: Be More, See More, Achieve More That Really Matters by J. Michael Godfrey is an excellent book that takes the reader from a state of hopelessness to action. From the first page, I felt a transformation taking place. Immediately empowering its readers, this book then shows novel techniques that can help keep the reader on their path to a regret-free life. This book explains what causes regret and how to avoid it by planning and following their plan. I loved how the author's voice is both encouraging and comforting; like a life coach standing beside you, guiding you to make better decisions. I believe it is the perfect book to read and apply for the New Year. I recommend this book for those that feel as if they are stuck, stagnating, or wish to live a healthier, happier life.